Lexus has confirmed pricing for the upcoming IS 250C, which goes on sale in the UK next month. 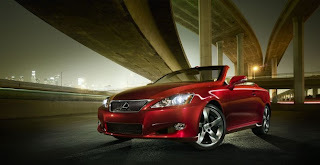 In the base SE-I trim, the Lexus IS 250C starts at £34,550. To have the SE-I fitted with the Lexus Navigation system costs an extra £2,200. Prices start at £43,250 for the flagship SE-L model equipped with the Lexus Multimedia Pack.